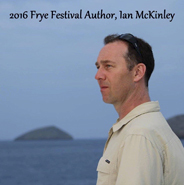 Ian McKinley is a Canadian diplomat and writer of “fantastic realism,” fantasy that escapes the traditional tropes of pure good versus ultimate evil. Rather, Ian’s narratives are driven by alignments and/or collisions of human interests and values. His first novel, The Gallows Gem of Prallyn explored an explosive mixture of zealotry, class oppression, and nationalism, the results of which take the reader on a gripping adventure. Ian unveiled his second novel, Harbinger, Book One of Northern Fire, at the 2016 Frye Festival, in which he participated as a “Prélude Emerging Writer.” Harbinger explores the role of violence in society and between different peoples as well as the question of whether an individual can change the fate of an entire nation. Ian is putting the final touches on The Winter Wars, Book Two of the Northern Fire trilogy, for an expected release by Spring, 2019. Ian was born in Calgary, Alberta, and grew up in Northern Ireland and on the Canadian prairies. He has served Canada abroad in Colombia, Kenya, Zimbabwe, and at the Permanent Mission of Canada to the United Nations in New York.